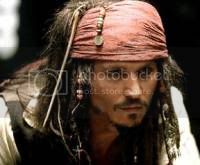 You scored as Captain Jack Sparrow. Roguish,quick-witted, and incredibly lucky, Jack Sparrow is a pirate who sometimes ends up being a hero, against his better judgement. Captain Jack looks out for #1, but he can be counted on (usually) to do the right thing. He has an incredibly persuasive tongue, a mind that borders on genius or insanity, and an incredible talent for getting into trouble and getting out of it. Maybe its brains, maybe its genius, or maybe its just plain luck. Or maybe a mixture of all three. I took pleasure in the site and I will go back! Look into my al alabama house cleaning blog. Possibly last post for awhile??? ?